This post is sponsored by Farm Rich. All thoughts and opinions are mine alone. Ultimate snack board for game day, a beautiful balance of healthy and indulgent! Raise your hand if you’re into game day only for food. Me, me, me! And because I’m actually not into the game itself, sometimes game days sneak up on me without a warning! Like surprise, tomorrow is the game day!! Whoa, and I invited friends over? Yep, been there! And guess what? You still need to prepare awesome food, because otherwise it’ll be a huge bummer. Is that you right now? Don’t panic!! Because it has happened to me before, I’ve got a great idea to save the day! 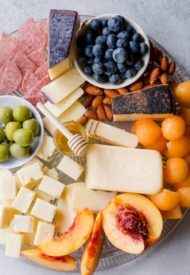 Let’s make a fabulous snack board, a beautiful balance of healthy and indulgent! 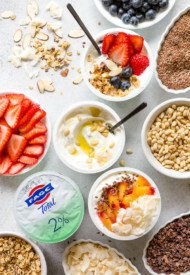 Friends, look at these amazing Farm Rich snacks!!! 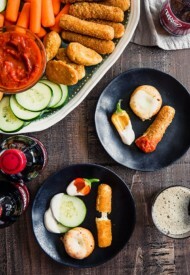 We’re having Mozzarella Sticks, Jalapeño Peppers and Mozzarella Bites!!! These convenient frozen snacks are ready to be served from oven to the table in literally in minutes! While they’re baking in the oven, you can chop up some colorful veggies to balance everything out. And you’re all set and ready to party!! Ok, let me tell you a little about these snacks. 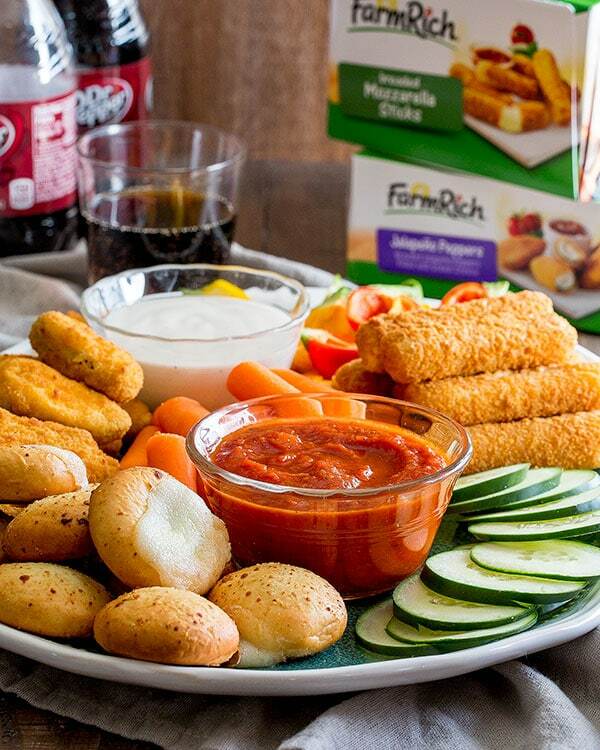 Farm Rich Mozzarella Stick! 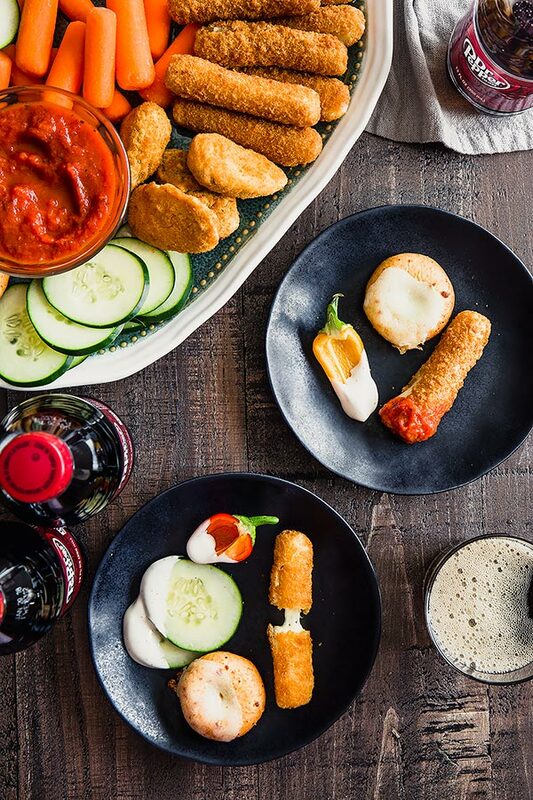 I mean, who doesn’t love mozzarella sticks? 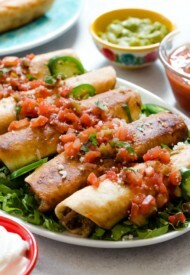 They’re my all time favorite appetizer! Crisp flavorful breading and ooey gooey cheese, dipped in a marinara sauce, it’s seriously so good. And I thought I can only enjoy them at restaurants. Nope, not anymore, because my freezer is stocked with these now! Up next, my favorite pillowy soft Farm Rich Mozzarella Bites. 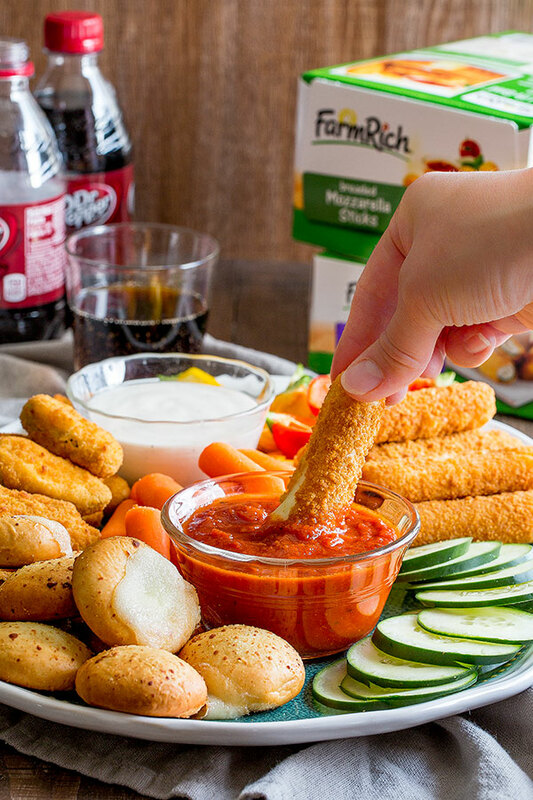 Unlike mozzarella sticks, these bites of heaven are so soft and fluffy with a layer of cheese inside. And last, but not least, Farm Rich Jalapeño Peppers! You know I love me some jalapeño poppers, especially wrapped in bacon. But these breaded version stole my heart in seconds! It’s embarrassing to admit how many I can eat of these little things! There you have it, no more stressing over game day snacking! 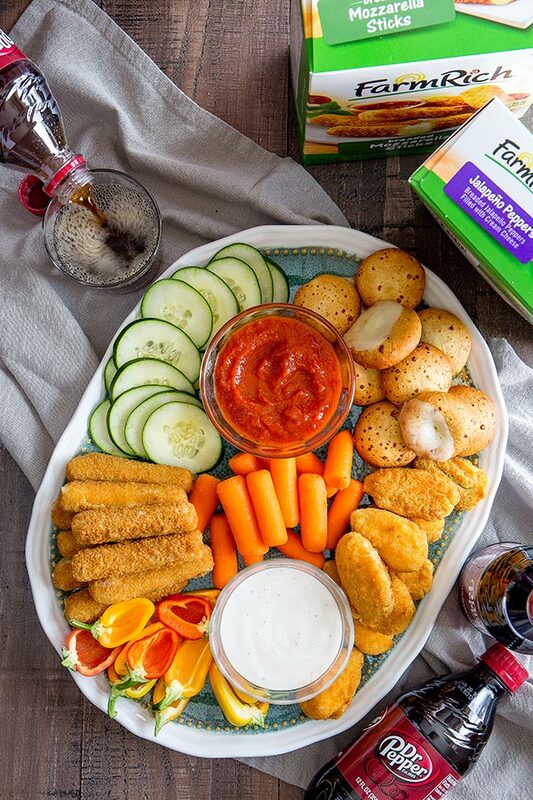 Arrange Farm Rich Mozzarella Bites on a baking sheet in single layer. Bake for 8-10 minutes. 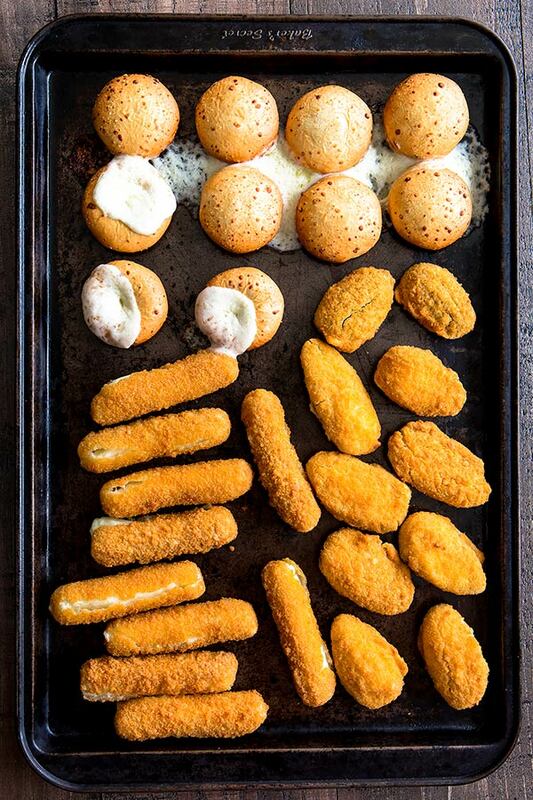 Arrange Farm Rich Mozzarella Sticks on a baking sheet in single layer. Bake for 9-11 minutes. Arrange Farm Rich Jalapeño Peppers on a baking sheet in single layer. Bake for 11-14 minutes. Cut the sweet peppers in half, remove the seeds. Arrange everything on a large platter and serve!